Ralph Ellis, journalist, husband, father, and grandfather has died after a battle with cancer. 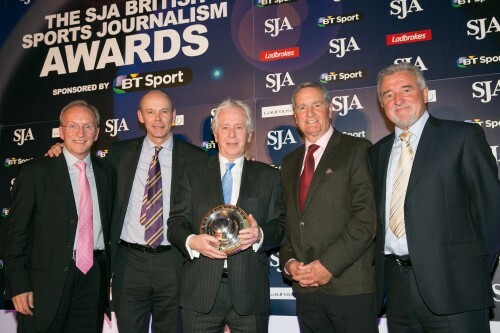 Colleague, friend and immediate past chairman of the SJA, DAVID WALKER pays tribute. The passing of a contemporary is always a sad moment. It emphasises the fundamental fragility of our lives. But when your friend is a man of impeccable honesty, integrity and reliability the sense of mourning is even greater. Ralph was a fine man, proud of his family, of his fitness regimes including running marathons that left the less fit and more fat among us shaking our heads in amazement. He was also rightly proud of his standing as a sports journalist. We first met when Ralph was working on the Birmingham Evening Mail in the 1970s and remained friends from then on. For most of our working lives we were on rival newspapers but that heightened the respect in which he was held by the “opposition”. Many foreign sports writers cite Euro 96 as one of their favourite tournaments. Maybe, because it was on home soil, we found it easier to hail Italia 90 as our favourite tournament but it was during that hot summer of 1996, with England as the host nation, that I got to know Ralph better than ever and realised what a skilled operator he was. This was a time when England coach Terry Venables found himself caught in a media frenzy generated by leaks about his business dealings, debates about his fitness to be in charge of the national team and that all came in between the occasional international match as his team attempted to become champions of Europe. Ralph’s diligence in pursuing the toughest story could never be questioned. In those days the post-match press briefings would be held underneath the old Wembley with the media scuttling away to file their copy as quickly as possible. Ralph was impeccable in spotting the sharpest news line for a back page splash, sorting out an intro and then getting his copy filed so it could catch as many editions as possible. He didn’t bother racing back to the press box. He filed from the old Wembley tunnel, where the teams used to walk out for cup finals and internationals. There was no kite-flying in Ralph’s armoury. He had great contacts who trusted him and helped him file clean copy that the sub-editors admired and simply poured into the newspaper. Our careers had another parallel when we both spent time in professional football clubs. Ralph worked on the commercial team at Bristol Rovers. After emerging from there he took on a welter of freelance work and accepted an invitation to file match reports for the Sunday Mirror during my time as sports editor. It didn’t take long for the production guys on our staff, many of whom had never worked with Ralph before, to realise he was a great pro. His copy was never late and never needed heavy subbing. More importantly, knowing that in Canary Wharf Towers we didn’t have live coverage of a Saturday game he would be attending, he would call if anything newsworthy had happened before even Jeff Stelling and the boys on Sky Sports could be shouted at by Chris Kamara. Unbelievable. I lost count of the number of times Ralph called in with a clear, concise interpretation of an incident in his game that would become a live back page splash or a spread as the main quotes match of the day. And you knew you could totally rely on his professional judgment. That was another adjective you’d place alongside Ralph’s name. Reliability. As our brothers and sisters at the FWA know full well, when it came to sorting out and running their prestigious golf day Ralph was the man. He was the epitome of a calm, clear-thinking professional. In recent years his cancer had tested his health and fortitude. But outside his family, he always showed immense bravery and resolution to battle on. And he was always willing to help others, especially journalists, who were facing the same kind of life-changing battle. Ralph didn’t suffer fools but he had an innate decency that made him one of the best people you could have on your side in the competitive world of Fleet Street. He will be missed.